During this summer season, Sweat is the major concern, due to which bad smell and a sun rash on your skin is a torture to your skin. 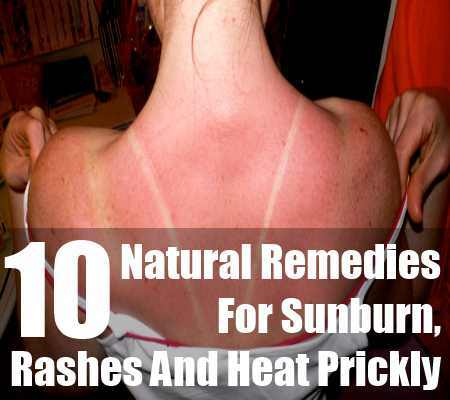 Even if you use talcum powders or take bath showers frequently these heat prickles on your skin cannot be escaped. Let us try few natural and home made techniques to get rid of sweat, sun rashes and heat prickly. To get relief from Sun rashes and prickles oatmeal is the best solution. Take ½ cup oatmeal powder and mix with water to make a smooth paste. Apply this paste on places having Prickles. Wait for 20 minutes and then take a bath with cold water. When the sun rashes are red and burning apply 2 spoons gram flour, add water and apply the paste over the affected area and wash off when dried. Take a smooth cloth or sponge and dip in cold water and apply on the sun rashes and prickle; you can see the cooling effect. On the neck, back, fore head apply ice cubes and rub. Take small piece of the bark and make it into powder mix some water and take few Neem leaves and mix all of them and make it into a paste. Apply and massage this paste on your body and wash off with cold water and apply talcum powder, all rashes and other skin problems would vanish. Take 4 spoons fuller’s earth, 2 spoons rose water and mix them. Apply this paste as a mask on your body and take bath after ½ an hour, See the cooling effect you get! Take coriander leaves and dry them in sun and make it into powder, In that mix sandal powder, rose water and apply on the effected areas of your skin. Use this pack 1 or 2 times in a week and see the results. Before taking bath in the evening apply aloe Vera pulp on your body or affected areas and wait for ½ an hour and take bath, It also cures other skin problems. Aloe Vera is a great natural moisturizer. During these summer days use a moisturizer which has less oil and more of water base. Mix a few drops of essential lavender oil in your water and take bath as it gives a cooling effect on your skin. Take wheat corn flour, wheat corn stock and water and make a paste and apply on the affected areas and wash off after it gets dried. Take camphor powder and mix few drops of Neem oil in it and apply on the sun rashes and prickles you can see that the burning sensation and irritation is lessened effectively. You body also cools immediately. Make changes in your diet also for effective results. Have foods which have less oil content in it and more of water content for hydration. Foods to be used are Water melon, pineapple, lime, mint leaves. Have sugar cane juice once in a while as it cools your body and give enough hydration and it also contains vital nutrients for your body in summer. Have lots of fruits, especially citrus fruits. The clothes you wear also has affect on your skin. Wear loose clothes; avoid tight fitting clothes when going out in the sun. Wear cotton clothes instead of synthetics. Wear light colored clothes than dark clothes as dark colors absorb more heat.